German-American business relations are stronger than ever with highly attractive investment conditions in the U.S. – Join the German American Chamber of Commerce West (GACC) for the first economic outlook event on the West Coast on January 16th, 2014 at the Silicon Valley Bank in Santa Clara. 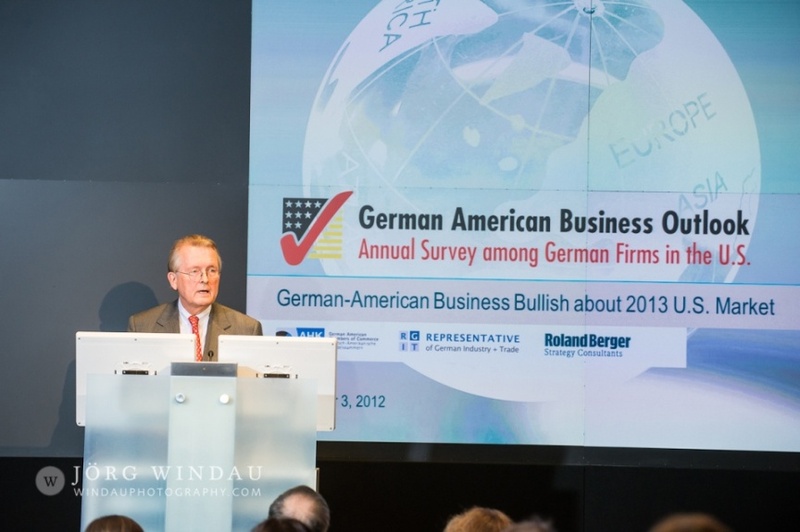 For the fifth consecutive year, the German American Chambers of Commerce (GACCs) in cooperation with the Representative of German Industry and Trade (RGIT) and Roland Berger Strategy Consultants have surveyed over 1,900 German subsidiaries in the United States to assess their economic outlook. The results of the survey are presented at the New York Stock Exchange and receive broad media coverage since they are an important indicator for German American business relations. This year the GACC office in San Francisco will publish the results also on the West Coast to discuss the opportunities of German-American business growth. The presentation will include a closer look at the transatlantic Trade and Investment Partnership (TTIP) which is currently negotiated between the EU and the U.S.
Join the German American business community for an interesting discussion about the economic outlook of 2014, German-American business growth and the opportunities of the Transatlantic Trade and Investment Partnership (TTIP). The business breakfast will take place on January 16th at the Silicon Valley Bank in Santa Clara, and feature presentations by Dr. Thomas Zielke a Representative of German Industry, and a panel discussion with representatives of German and American corporations in the Bay Area. For this year’s event information click here. To take a look at last year’s event in New York here . GACC (German American Chambers of Commerce) will hold a half day conference on “The Future of Mobility – How German Design will Move Us.” This half-day Design Event will take place in Los Angeles at the Pacific Design Center, West Hollywood on August 13th, 1pm – 8:30pm. Design has long since crossed the border from being only aesthetically innovative. These days it has proven to be essential as a provider of solutions for the challenges of our time. Germany has been an important influence on international design since the German Bauhaus school (1919-1933). The school favored simplified forms, rationality, functionality and had an influence on art, architecture, and industrial production design that was unmistakable. With Germany’s 2011 decision to abandon nuclear energy completely, Germany has become an example of an economy based upon renewable energy. This August conference promises to highlight current trends in mobility solutions, discuss their impact on human behavior, and will explore electrical cars, e-bikes and airplanes. German and American design experts will introduce their ideas and applications during this half-day conference, which invites to meet and mingle with the renowned designers at a special networking reception after the program. The spotlight during this conference will be on the new BMW i3 model with eDrive, which will serve as an example as a sustainable vehicle designed for urban areas, and which is driven purely by electric power to meet the demands of sustainable and emission-free mobility. For Tickets please register at the GACC website ! Deutsche Spargelzeit – German White Asparagus Season : Get the Real Deal in San Francisco! ‘Unfamous’ in CAlifornia, white asparagus has celebrity status in Germany. Traditionally, “Spargelzeit”, the white asparagus season, starts in Germany around mid-April and lasts until June 24th. But this year, because of the harsh winter, the harvesting time has been moved out to almost the end of April. It was just too cold for the asparagus to grow and the only available one until recently arrived usually from other European countries with warmer climates. But now it’s finally here! Germany’s Spargel season has officially started and with great anticipation connoisseurs are looking forward to tasting the new season’s “royal vegetable”. During the season the vegetable also referred to as “edible ivory” or “white gold” is prominently featured on menus everywhere. In order to bring this tradition a little bit closer to everyone in California, the German American Chamber of Commerce, Inc. (AHK) will import fresh white asparagus from Germany to San Francisco! 100 kg of fresh harvested Spargel will be imported directly from the “Spargelhof Schulze” in Rheinland -Pfalz (Rhineland-Palatinate) straight to the plates and palates of the German American community in San Francisco. The second annual White Asparagus Gala Dinner will take place in San Francisco on May 10th, 2013 at the InterContinental Mark Hopkins on San Francisco’s Nob Hill. Tickets will include a Champagne Reception, 3-course Gala Dinner and beer/wine/soft drinks. Get ready for an original Spargel Dinner, the traditional German way! German Mixer in Orange County meets tomorrow Wednesday, September 1st at the Kimera Restaurant & Lounge, 19530 Jamboree Road, Irvine 92612. The event starts at 7pm . There is no admission. Bar is no-host. No need to RSVP. Just be there and have fun! 06:30 PM – 09:00 PM at Speisekammer, 2424 Lincoln Avenue in Alameda.